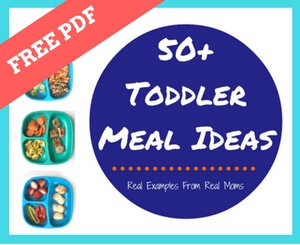 Toddlers are known for being picky eaters and enjoying the same food over and over. Here are 5 tips for preventing common toddler food jags. Give them pizza and the Serbinski kids will eat and entire large. Yep, no joke. While I think pizza is more of a food preference, I could consider it a food jag in this house when the boys wake up for the day asking for it! Food jags. While they sound like some awesome workout move that can be done while eating dinner, they’re actually an annoying mealtime situation that many parents and caregivers face. Does your child want the same thing at every meal? Pancakes? Yogurt? Goldfish? Oh and sorry for reminding you but they will only eat THAT particular food at each meal too? Yep, that’s a food jag. Been there. Done that. And going through it right now with my toddlers. A food jag is when a child will only eat one food item, or a small group of foods, meal after meal. Right now the food my kids clamor for from the time they wake up until the time they go to bed is milk [and pizza like I shared above]. MILK. I sort of feel like everyone has reverted back to their baby ways after spending the past year in little sister’s shadow and since we’ve been giving Ms. Lily cow’s milk, big brothers want all the milk they can get! And believe me, their tummies can hold a lot of it! While I’m all for giving kids foods they ask for in moderation [they need some control in reason, right?] I think milk can be one of those foods that toddlers fill up on. And then they won’t eat the rest of their meal! Little sis is currently throwing everything off her tray at dinner except milk. What you can’t see behind the milk is her eyeing a piece of food that is about to be launched. While I’m all for a feta and cheese omelet, I would certainly get sick of eating it at every single meal. Or every single day. Toddlers on the other hand? I haven’t figured mine out. But I have figured out a few ways to get past the pesky food jags. Don’t make it a huge issue. No child is going to go malnourished if they only eat bananas and blueberries for a week (especially if they are drinking milk or formula). Offer the “chosen” food along with other nutritious choices. Within a short period of time, your LO will likely start choosing other offered foods. Get your child involved in the shopping and/or cooking. Take your child to the grocery store with you- talk about and/or let him hold different foods. And if the thought of grocery shopping with your child stresses you out, have him help unload or unpack the groceries. When you are making his meals at home, talk to him about what you are doing in the kitchen. It’s never too early to get your child involved! If this tip intrigues you, you might like my post on how toddlers can help in the kitchen. Serve their favorite a different way. I know this sounds counterintuitive. But if your child loves cooked carrots, try serving them raw with a dip and see how they handle that change [here are 5 of our favorite kid-friendly dips]. Mixing it up might change their mind on other foods as well. Serve new with their favorite. And know that it might take up to 15-20 times for the new to be “liked” or tasted again. While that might seem like a lot of tries, remember you likely make 3 meals and 2 snacks a day for your child. So those 15-20 times will go by fast! Be an example and try to make family meals a priority. Don’t just put a plate of food in front of your child and stare at them. Sit down and enjoy the same healthy foods yourself. Talk, keep things fun, and try not to stress about the mess they are likely making [read more about my philosophy on family meals]. While I’m all for serving the family ONE meal, when the kids are going through one of their picky phases or food jag phases, I tend to serve meals in a way I know they’ll like [or recognize]. So my bruschetta chicken was deconstructed into grilled chicken for them + pasta with marinara. One of the most important things to remember during this “stage” of feeding is not to use food as a bribe, threat, or punishment. Simply continue to expose your child to new foods on a regular basis- as long as you don’t spend most of your day kitchen! I guess you could consider this tip number 6: Cut yourself some slack. Feeding kids is really, really hard. And if your house is anyone like mine, mealtime is super stressful. So take my advice from 1-5 in stride and maybe focus on 1 or 2 of these tips rather than thinking you have to tackle all 5! Hungry for more? Here are some of my favorite posts on picky eating from the Mom to Mom Nutrition archives. *Note: If your child is NOT eating anything- breastmilk, formula, or solid food, consult your physician. Our ideas and suggestions are not meant to take the place of medical advice. It’s strictly advice we are sharing based on experience with my own children (not from a medical textbook). Nice tips! Kids have a natural preference for sweet and salty foods and reject bitter and sour flavors.